When you create a home gym, there are many factors to consider, including the type of equipment you will include and the layout that will be best for performing various types of exercises. 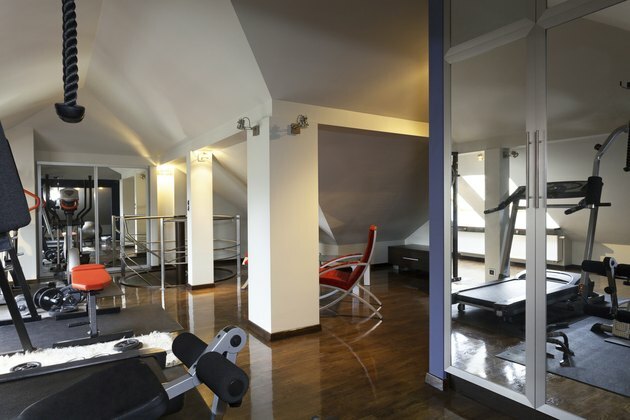 One element of a home gym that’s important not to overlook is the flooring. You need the flooring to be sturdy, easily cleanable, and right for your equipment. You will most likely use your home gym for a number of purposes such as practicing yoga, exercising to aerobic DVDs, using free weights and possibly exercising on a machine such as a treadmill, elliptical or stationary bike. A multipurpose floor should suit your needs, since you most likely won’t have specialized needs such as a basketball court or other specific sport. Wood flooring is generally used for multipurpose areas; alternatively, choose a synthetic hard floor if you need a less expensive option or know that you won't be able to keep up with the maintenance that wood requires. As you would imagine, cleanliness is a prime concern in an exercise room, especially for the floor. Choose flooring that will be easy to keep clean and sanitized. For this consideration, a synthetic hard floor is your best choice. An article in "Recreation Management" explains that this type is easy to clean, and many of these floors have an antibacterial finish as well. Your considerations should go a bit deeper than the actual flooring material. Check that your floor is strong enough to handle the weight of exercise equipment, especially if your home gym won't be on the first floor of the house. Consider consulting a contractor about adding additional bracing underneath the floor if necessary. You can also provide some cushioning underneath exercise machines and weight racks by adding removable mats. Fitness World explains that rubber equipment mats will protect the flooring and also protect an exercise machine from dust and debris. If you’re deciding on the flooring for a commercial gym or exercise studio, some different factors will weigh your decision. You'll need a floor that is easy to clean, such as a wood or synthetic hard floor because of the prevalance of germs in public exercise spaces. Consult a flooring company on the best type of flooring for the purpose; for example, a basketball court should have a hard floor such as wood without much give, so that balls bounce and players can jump. For a multipurpose room, you can usually use wood or synthetic hard floors. A multiuse setting also needs to follow international flooring standards. Is It Bad to Exercise on Carpeting?